Omg!!!! Where have I been? Why did I not try this earlier, ok tell a lie I attempted other times but coming from a dance class with no make up I was scared I be turned away. I wasn’t too hungry at the time I called my friends out intending to head to soho for ice cream but the plan changed and we had yoomoo and the parlour instead. The lemon peel creme brûlée was the most appealing to me at the time. It came within minutes nicely presented on a chopping board garnished with powdered sugar. The top was caramelised and it was yummy, vanilla creamy consistency and the lemon was odd but went very well together. My friend had sausage and mash and it was the best I’ve tried in London. My friends rave this place a lot and I shall be returning for food soon! 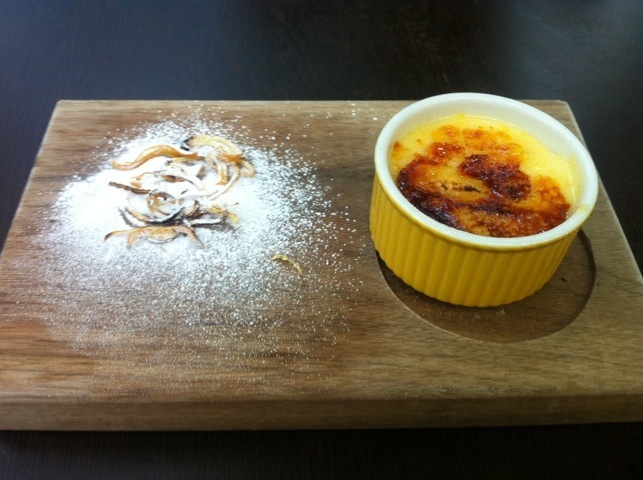 Mmmm… creme brûlée is one of my favourite desserts, not beating the ultimate apple pie/crumble though =p! Looks delicious.. might have to check it out! I heard food is gorgeous… Next time getting some prawn lollipops n Sunday roast. Haven’t been home lately when I get the chance I will go through your food post.